Worldlines, my brand-new piece for three or more sustaining instruments, gets its premiere tonight at the Abroms-Engel Institute for Visual Arts in a concert of chamber music inspired by Jessica Angel’s site-specific installation Facing the Hyperstructure.The program features three other world premiere compositions by Monroe Golden, Kyle McGucken, and Tom Reiner. The pieces will be performed by Hillary Tidman, flute; Diana Dunn, oboe; Kathleen Costello, clarinet; Tariq Masri, bassoon; and Kevin Kozak, french horn. The event begins at 5pm with a reception and time to take in the artwork, followed by the concert at 5:30pm. Like many of my recent scores, the musicians performing worldlines determine the moment-to-moment shape of the music. In this case, all of the musicians share the same written material and use hand-signals to determine how they navigate through it. One hand signal may cue players to repeat their current phrase, while another may cause them to read backwards through the score. 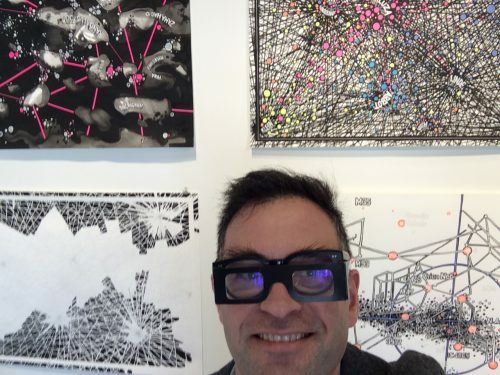 Here I am trying out a pair of ChromaDepth glasses surrounded by Jessica’s artwork. The glasses add a sense of depth to Angel’s vividly-colored environment.